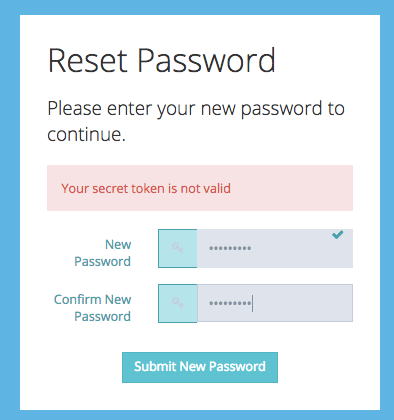 If you or one of your users receive the error ‘Your secret token is not valid’ when attempting to setup a new password or change an existing password the solution is simple. The user has taken to long to setup their new password or change the existing password. The time limit for the initial link is 24 hours. The second reason for this error is if the change/update password email was sent out multiple times. If a user attempts to click an earlier link that is no longer valid this error will occur. Always use the most recent email that was receive when changing or updating your password.